Orkney produce will be the star of the first episode of celebrity chef, James Martin’s new series, on ITV this Monday, February 11. James Martin’s Great British Adventure will see him join forces with Nick Nairn, shopping for hand-dived scallops, before setting up a mobile kitchen in Stromness to make barbecue scallops with black pudding, apple and hazelnut butter. While in Orkney, he visits Barony Mill for the lowdown on Orkney’s bere meal, and also the makers of Orkney Craft Vinegar — hailing it the best he has ever tasted. North Ronaldsay also features, where resident Billy Muir introduces the chef to the island’s famous sheep. The journey ends with a boat trip to catch brown crab. Reaping the rewards of the TV chef’s comments this week is Orkney Craft Vinegar. James Martin gave their product a glowing review on his Saturday Morning show at the weekend — and the company have since been inundated with orders. 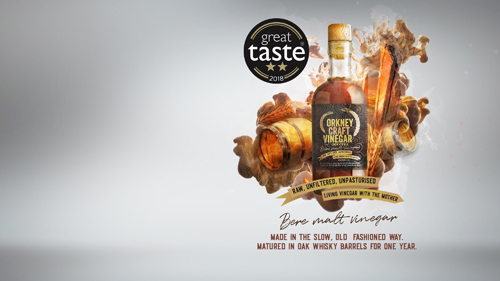 Orkney Craft Vinegar is handmade using bere barley, an ancient grain unique to Orkney. Sam started out on the island working at Barony Mill — a historic watermill famous for grinding bere. While there he had the idea to create vinegar from bere using traditional methods and gradually incorporated flavours found in abundance on Orkney, such as meadowsweet and seabuckthorn. You can catch the first episode of James Martin’s Great British Adventure, featuring Orkney, on Monday, from 2pm-3pm, on ITV.